Want More Truck Bed Information? Our Great Northern beds have a very similar look to that of a Bradford Built but with improvements. They have a double rail system to accommodate both 38" and 42" frame widths with the same bed. The latch post is a part of the headache rack. They are wired for a RV7 trailer plug at the tail and gooseneck, LED lights are standard, and we have an optional LED cargo light package also. 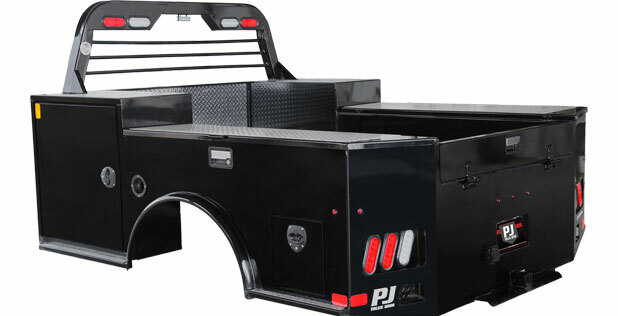 PJ Truck Beds was founded over 20 years ago in Sumner, Texas. Hard-working professionals count on the attention and detail that PJ Truck Beds have put into the thousands of truck beds they have built. 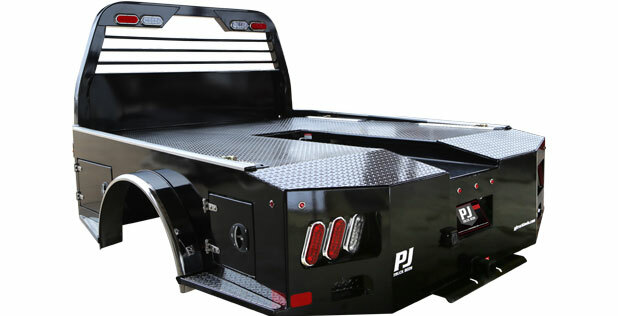 America’s Fastest Growing Truck Bed manufacturer, CM Truck Beds have built quality products at an unmatched price point. Recognized throughout North America, CM Truck Beds' Hauler Bodies are unique in styling which has led to a consumer base that is hardworking and loyal. 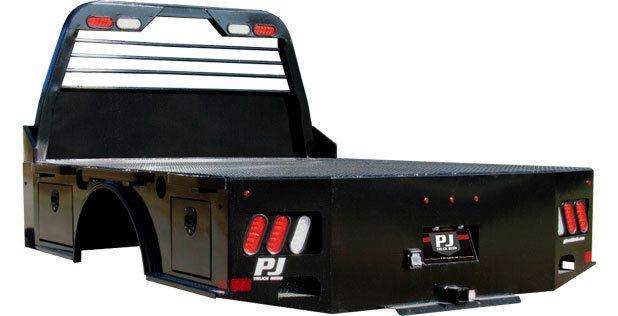 From flat beds to hauler bodies, our products are the toughest beds on the market, utilizing the industry's best hitches, tool box latches, and headache racks. Built to work. Built to last, not just a slogan, exactly what customers say about our products. If you use your truck for a truck, then you'll appreciate all the standard features on a Bradford Built truck bed; things like 1/8" thick tread plate floor, a 30,000 lb. rated gooseneck hitch and the incredibly strong receiver type bumper hitch. With the 6" tall flip-up side rails, you won't be back-tracking looking for your chains or spare tire. 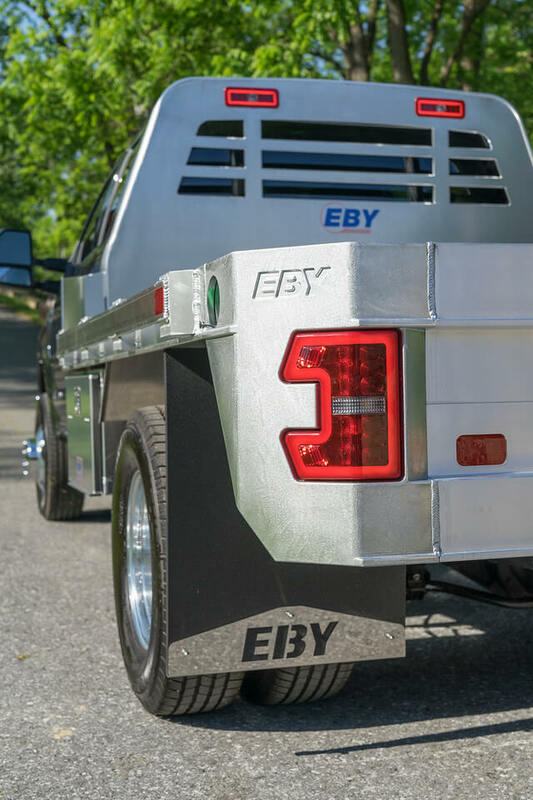 Eby flatbed truck bodies deliver extraordinary value. The smart engineering and robotic fabrication result in the industry-best flatbed truck body that’s far more than the typical towing body. Impressive standard features and options tailored to individual needs. Tapered bulkhead with integrated high mount LED combo and work lights. 20" extruded buck-plate with cast aluminum corners and LED tail lights. 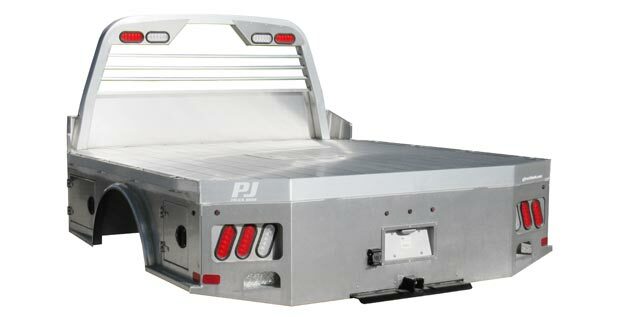 HD rear bumper with easy access steps and receiver hitch. 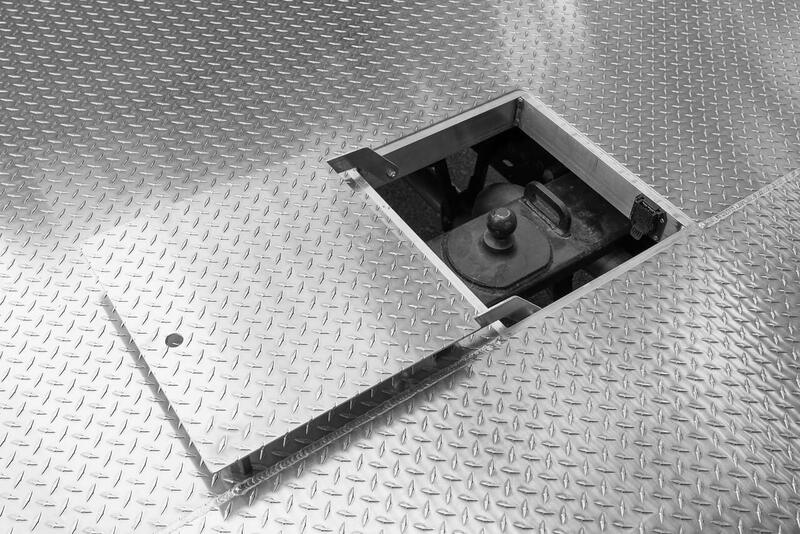 .156" diamond plate floor for hauling heavy loads. 5" j-sills and 3? cross members on 12" centers for cab and chassis models. 3" wide x 5" thick flat bar and 3" cross-members on pick-up box delete models. Rear window grill punched to allow maximum visibility from cab. 5" high extruded side rails with stake pockets and rub-rails. Formed aluminum wing brackets help retain cargo. Tapered bulkhead with integrated high-mount LED lights. Recessed gooseneck ball hitch with hidden trap door for easy access. Extruded sale rails with stake pockets. Diamond plate flooring for hauling heavy loads. CM Truck Beds - Built to Work. Built to Last. America’s Fastest Growing Truck Bed manufacturer, CM Truck Beds have built quality products at an unmatched price point. Recognized throughout North America, CM Truck Bed’s Hauler Bodies are unique in styling which has led to a consumer base that is hardworking and loyal. 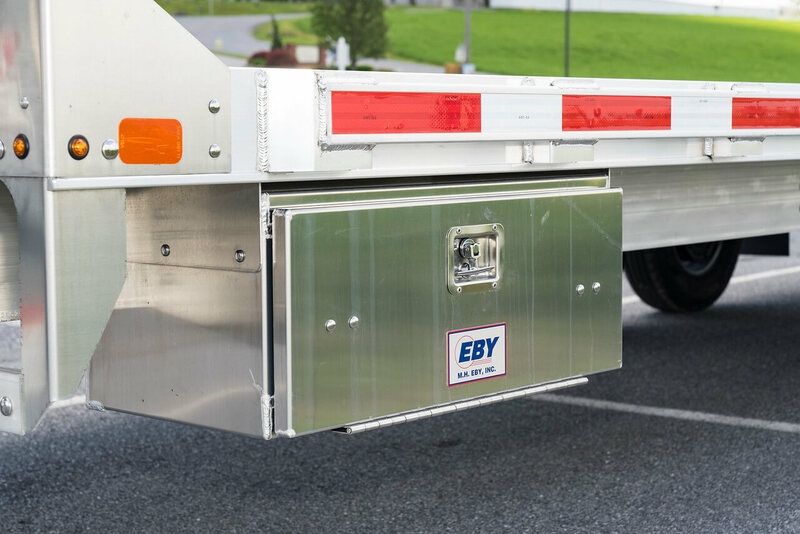 From flat beds to hauler bodies, our products are the toughest beds on the market, utilizing the industry's best hitches, tool box latches, and headache racks. Built to work. Built to last, not just a slogan, exactly what customers say about our products. CM’s headache racks follow the curves of the vehicle cabs they are mounted on, which makes them visually appealing. Our headache racks are 3.5? tube, thicker and more rugged than any other headache rack on the market today. Additionally, CM Truck Beds Models are thoroughly and continually researched to complement the ever-changing styles of the auto industry and to help us remain a leader in truck bed design and development. CM’s toolboxes are one of only a few in the industry that have recessed doors. When you compare our boxes to anyone in the industry, our box doors don’t ‘stick out!’ These doors are sealed with one piece, automotive grade, D bulb weather-stripping which significantly prevents leaking in our beds. Our one step compression handles are the easiest to use in truck bodies, sealing the door when you close it. This helps eliminate leaking which you consistently see out of competitors’ truck bodies. Rear trail boards are formed as one piece to give the bed a cutting edge look at rear integrated bumper pull hitch. These tail boards are one of a kind and give customers a sleek automotive styled look. Speaking of hitches, CM Truck Beds has recently introduced B and W brand hitches as a standard on all of our hauling beds. 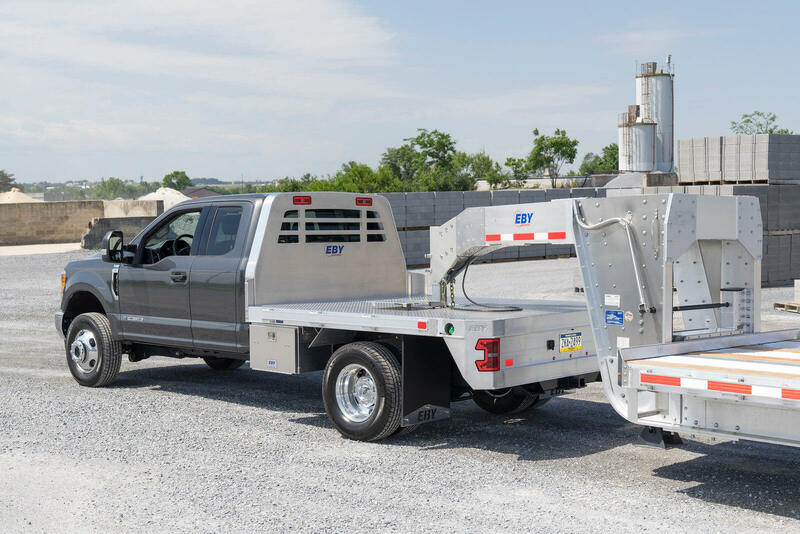 Our products all come with a 14,500 lb rated bumper pull hitch and a 25,000 lb gooseneck hitch box with an optional 30,000 lb B and W Turnover hitch. CM Truck Beds feature 4? structural channel frame rails and cross-members made of structural channel – not tubing. The benefits are that the channel doesn’t hold water and is not as conducive to rusting. We utilize 11 gauge steel decking, not 13 gauge like many of our competitors. You won't see warping out of our bed decks. The tail board features a full 21? height for cab and chassis models and 16? to 18? for trucks that come with a factory bed. Our headache racks are made of 3.5? tubing, not 2? or 2 1/2? to withstand the rigorous work that users put our beds through. When you look at and feel our headache racks, you will quickly see that our beds are Built to Work. Built to Last. 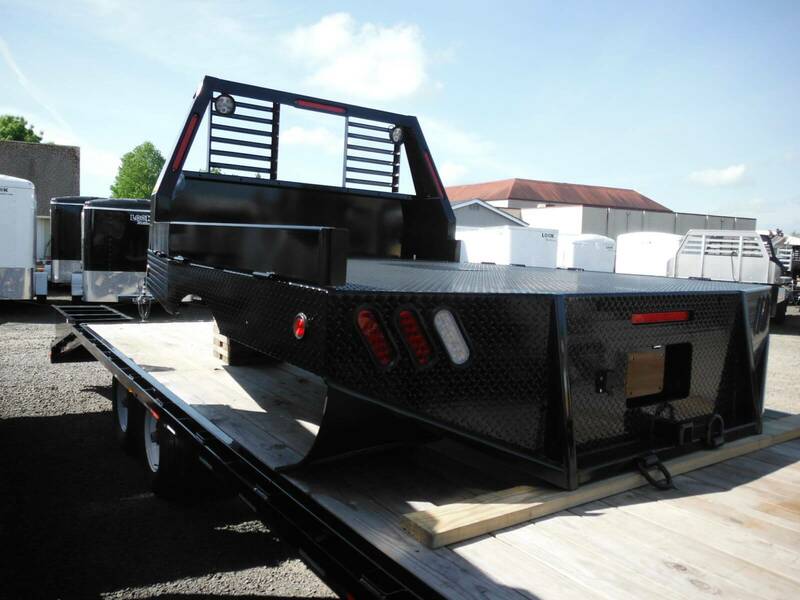 CM Truck Beds go through a 5 stage powder coat finishing process that provides the bodies with excellent gloss retention. Additionally, the powder coat gives the bodies’ unmatchable durability and longevity that will keep enhancing the truck’s appearance for a long time. Our truck beds possess quality materials to promote durability and longevity. Take a look at our platforms, made of 11? gauge steel, superior to industry standards and a sure to last longer than any beds on the market. 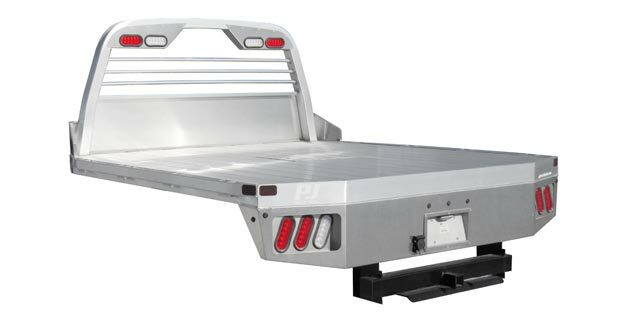 Whether a customer needs an aluminum truck bed that is lightweight and hard working, or they require the strength of a steel truck bed model to handle tough jobs, our beds are built strong with quality materials that can handle the job and keep going long after. Our one piece sealed modular wiring harnesses prevent our beds from having electrical issues like you see in many other truck beds on the market. CM Truck Beds offers eleven models, loaded with standard features, to fit every need. Options are also available on each model. We offer diversity with eleven different models, which are loaded with standard features to fit your needs. 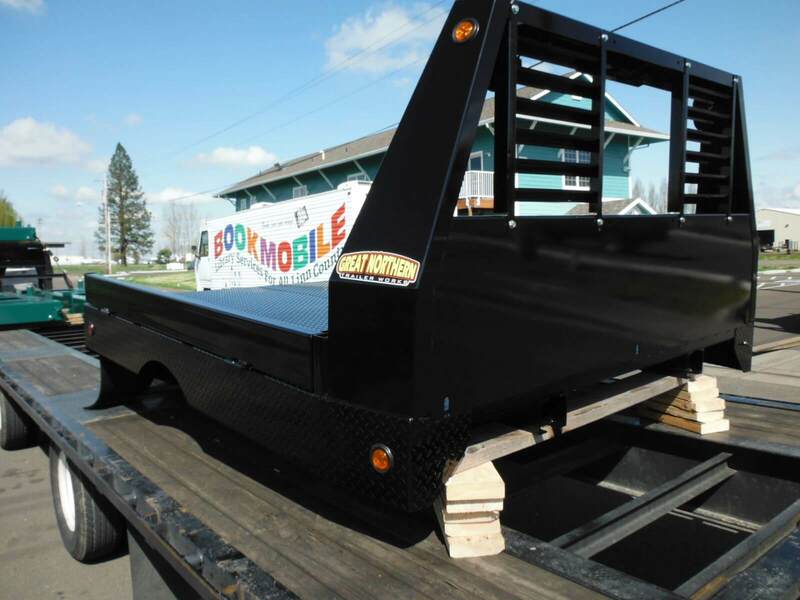 Our truck beds can fit 3/4 ton trucks and up, and range from flat decks that can be outfitted with under body boxes and accessories, to skirted beds with built in toolboxes. 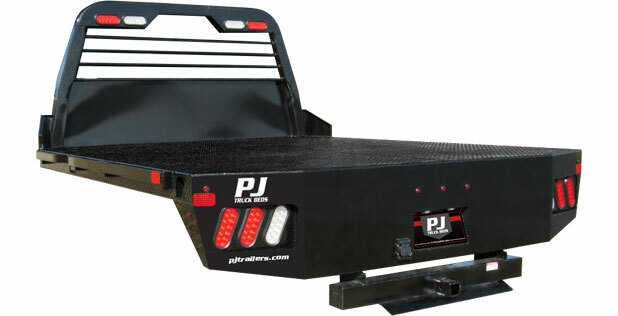 We also carry a hauler bed that has the custom hauler look for half the price. Need aluminum beds? We offer the industry’s finest all aluminum truck beds. If you use your truck for a truck, then you'll appreciate all the standard features on a Bradford Built truck bed; things like 1/8" thick tread plate floor, a 30,000 lb. rated gooseneck hitch and the incredibly strong receiver type bumper hitch. 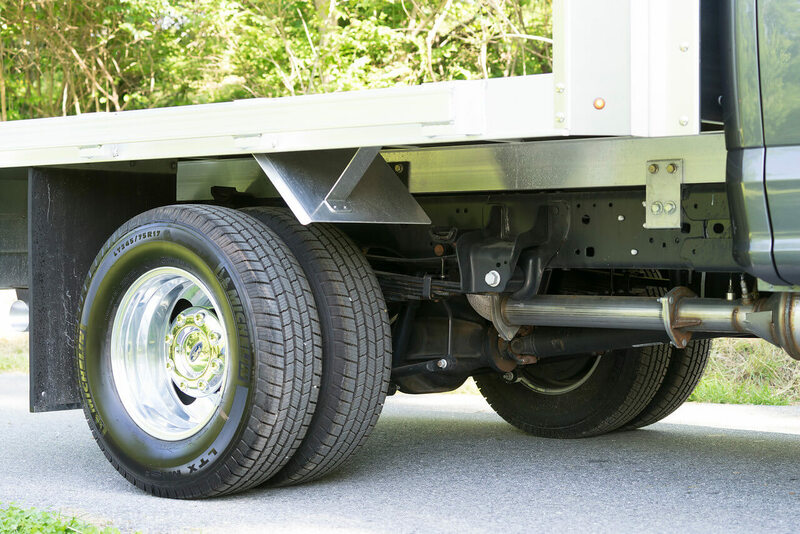 With the 6" tall flip-up side rails, you won't be back-tracking looking for your chains or spare tire. Chain "keyholes" in the headache rack, flush-mounted D-rings in the side rails, and stake pockets in the deck make it easy to secure any load. 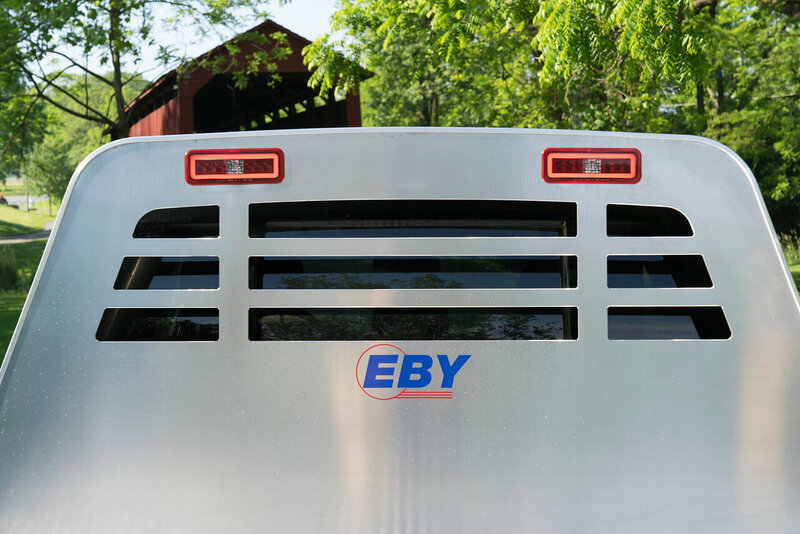 The sealed beam lights are flush mounted and there is a 7-pole plug-in for your trailer. The rear corners of the deck are tapered so backing up a little too close to the dock won't take out the lights. The forward taper also allows for locating the gooseneck ball further forward while still clearing your trailer gussets in a turn. The powder coat paint gives it a good shine and easy to wash surface.